The research team at Social Science Baha (Bina Limbu, Jeevan Baniya, Manoj Suji, Nabin Rawal, Prakash Chandra Subedi) have just successfully completed the first round of fieldwork in the three research sites: Bhaktapur, Dhading, and Sindhupalchok. Having spent time in each location speaking with local community members, the researchers found significant differences in terms of how government reconstruction cash grants (tranches) were being distributed, access to construction materials and skilled labour, and community interaction with the National Reconstruction Authority (NRA), National Society for Earthquake Technology (NSET), and various NGO’s. Findings revealed that the building process and design of the government-approved houses were an important point of tension among communities in all three locations. At the time of this study, many households believed they would not meet the second deadline in order to receive the next tranche due to a shortage of skilled labour, expensive building materials, and changing government policies. Most importantly, the new houses (pictured below) were representative of the ‘reconstruction process’ itself, how it is understood and experienced differently across geographical locations, how pathways of labour migration have shifted since the earthquakes, and in what ways social capital and traditional knowledge factors into community decision-making. The project will continue to explore these and other related themes as the second round of fieldwork is set to begin in late July. Additionally, a photo essay by the three Social Science Baha Research Associates (Bina Limbu, Manoj Suji, Prakash Chandra Subedi) will soon be published on our website. Theses images were taken throughout the first round of fieldwork and speak to many of the issues referenced above. Dhading, Bina Limbu. Trained women masons at work for house reconstruction. There is a severe shortage of skilled labour as men have gone for foreign employment. 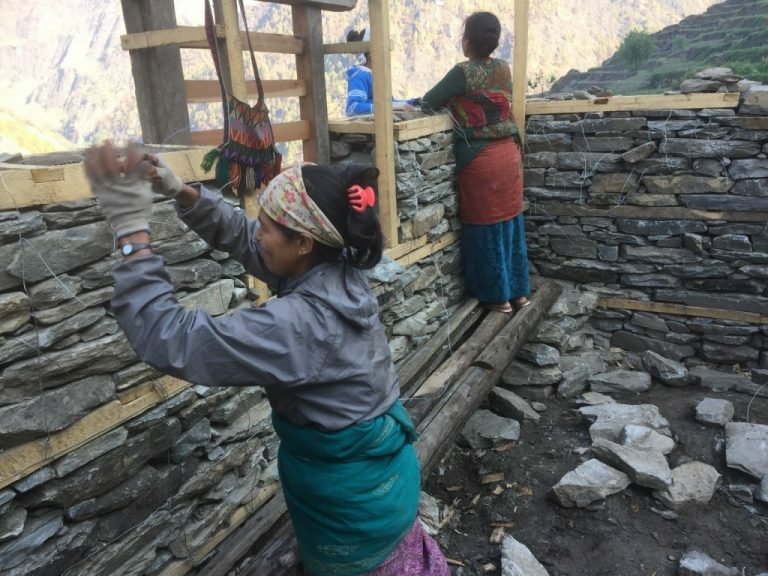 In this scenario, some women trained by National Society for Earthquake Technology (NSET) have been stepping up to work as masons. At first, women masons were frowned upon by the villagers due to patriarchal beliefs that women cannot do heavy labour but gradually they have become more accepting of them.